Yes! You CAN make Roux in a Microwave. Try it with this Chicken and Smoked Sausage Gumbo recipe. Trust me, it works! Gumbo is like meatloaf. Everybody prefers their own mama’s meatloaf, unless mama doesn’t make it. Mine didn’t. So I had to figure it out for myself. I’m not Cajun nor do I claim to be an expert in the cuisine although I did honeymoon with my husband in New Orleans. Does that count? I don’t remember much about the food on that trip, so I doubt it. 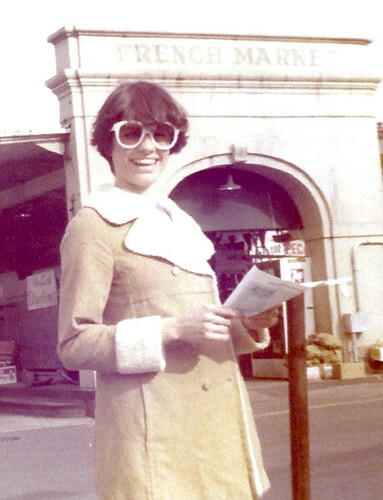 Honeymooning in New Orleans–1976. My husband still makes fun of my sunglasses and who could blame him. Why make a roux in the microwave? Microwaved roux requires less oil. 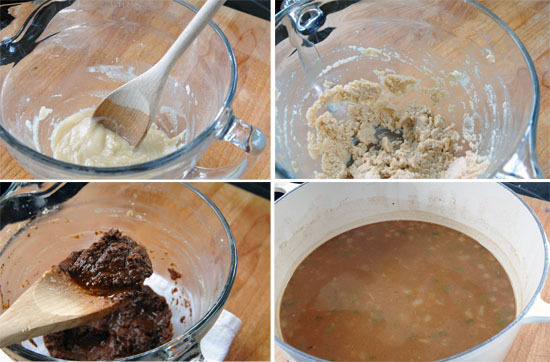 Making a roux (the characteristic dark brown flour and fat mixture) in the microwave is not the traditional way. Nonetheless, it works and requires much less oil than on top of the stove. I use a 2-quart Pyrex batter bowl because it can withstand the heat. In this Chicken and Sausage Gumbo, I used 1 part fat to 3 parts flour. If you prefer, use 2 parts fat to 3 parts flour or you can do one to one proportions. Less time is needed to obtain a dark color. Microwave ovens vary. But in my OLD microwave, roux will go from blond to a medium dark chocolate in about 10 minutes. Your timing will be different so pay attention. If necessary, record how long it took to get the color you want so you will know for the next time. When using less oil, you must mash the clumps of flour and oil against the side of the bowl. Instead of just stirring like you can do when using 1:1 oil and flour, you must press the flour and oil against the side of the dish to evenly distribute the heat and make sure the roux browns evenly. You’ll see what I mean when you try it. Do not use untempered glass or a plastic container for this method. Fat and flour get extremely hot and could melt or break your dish. 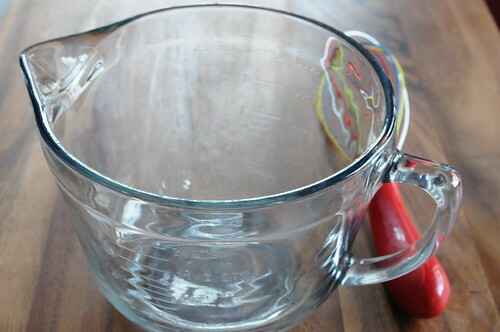 My favorite and much-used batter bowl is perfect for making a roux in the microwave. I don’t recommend using the whisk for this project. A wooden spoon works better. Making roux in the microwave. I first ate gumbo at my brother-in-law’s (Phil) house years ago. He was adamant about the absence of tomatoes in his recipe. I ended up loving his gumbo and his no-tomato policy, so I do the same. Regarding okra in gumbo: We love it, but the Cajun police will not arrest you if you leave it out. Gumbo is meant to be served with rice in the bottom of the bowl. I’ve heard that some people put potato salad under their gumbo. I load my bowl with mashed cauliflower, then put gumbo over the top. Serve with French bread. My husband likes saltine crackers with his gumbo. Chicken and smoked sausage gumbo including instructions for making roux in the microwave. Spray large heavy-duty Dutch oven with a light coating of vegetable oil and saute onions, pepper and celery. Cover to sweat and cook vegetables while completing step two. Stir oil and flour together in microwave-safe bowl. A Pyrex 2-quart batter bowl works perfectly. Place in microwave and cook on HIGH for 8-10 minutes stirring with a wooden spoon after every minute for the first 5 minutes and about every 45 seconds thereafter. Stir and mash flour against the side to be sure mixture is the same color throughout before returning to the oven. (If you see black specks, it has burned and needs to be thrown out. Start over again being careful not to overcook by stirring frequently and thoroughly.) Cook until oil and flour mixture is the color of chocolate. Some people like it even darker...not me. Add roux to softened vegetables in Dutch oven. Stir warm broth and remaining seasonings into roux and vegetable mixture until roux is completely dissolved. Simmer 45-60 minutes. Add okra and chopped parsley. Cook another 10-15 minutes. While veggies simmer in step three, dice sausage in to medium size pieces. Saute in medium skillet until brown. (Helps to relieve sausage of some of its grease.) Drain. *This is even better reheated after the flavors meld and marinate. I recommend making it early in the day. Chill and reheat for dinner in the evening. *I've been known to use mashed potatoes instead of rice and some people even serve gumbo over potato salad. I’ve got everything chopped and ready to go…but, noticed your ratios of flour and oil. I have always used equal amounts of each. Is this ratio due to putting it in the microwave?? My first attempt at Gumbo was about 5 years ago. I stood at the stove and stirred that roux for about an hour. The roux was almost the color I wanted and then my husband walked into the kitchen without me hearing him…so when he spoke to me, I was so startled and the roux that was on the wooden spoon ended up on fingers. I had four fingers with 3rd degree burns. The roux essentially “melted” my skin and flesh all the way down to the bone! We abandoned the roux and rushed to the ER because the pain was so intense I kept blacking out! Seeing the bones in my fingers probably contributed to the blackouts. I am finally ready to try again. I can’t decide if I am going to use the microwave for the roux, or use the oven. I’ve read that you can put the oil/flour in a dutch over and cook it in the over. Wish me luck!! Oh dear Tracee. Do be careful no matter how you decide to make it. You can also cook the flour by itself without oil in an oven for a much lower fat gumbo. But–it sure does smell up the house in a weird way. Good luck with your gumbo. This looks so delicious! I was wondering if this could be crock potted at all. I was thinking to go up to step 3 and brown the sausage, then throw everything in to simmer for a few hours. I’ve never used a roux before, would it be ok to use it that way or would this turn out horribly? Worth a try Courtney. Haven’t done it myself. I made this today and it was so good! Thank you for sharing. Hope you enjoyed your dinner, Cheyenne. I’ve tried many ways to make the roux, including the traditional way and baking the flour in the oven (which smells terrible). This is the easiest in my opinion. I love this recipe!! It’s been the best Gumbo I have ever made.I added shrimp. Hey Paula, just wanted to let you know what a huge hit your Gumbo recipe has been here at my home in Dublin, Ireland. I stumbled upon your recipe while on-line looking for a Gumbo recipe having heard it mentioned in the brilliant New Orleans set drama “Treme”. I’ll be checking our more of your delicious looking recipes very soon! Keep up the great work. Graham, I’m so glad to hear the gumbo recipe is a hit. Thanks for the testimony. Nice shades! I didn’t grow up with a family gumbo recipe, so your is perfect for me. Nice trick making the roux in the microwave. The Cajun police might arrest you for not using file powder in your gumbo. 😉 My father-in-law (who is as New Orleans as they come) always treats us to his killer gumbo the day after Thanksgiving. He uses turkey leftovers instead of chicken, which works just as well. Your recipe sounds delicious, Paula and it makes me homesick for New Orleans! I’m glad you mentioned file powder. I have used it before but it didn’t seem to make that much difference. Perhaps I didn’t use it in the right way. Any tips? Paula, I’ve only ever had gumbo with file in it, so I’m not sure how much of a difference it actually makes. The only thing that does make a difference is when you add the file. It’s always added to the finished gumbo, because if it is boiled the file’s consistency will become really funky. or as we say let the good times roll!. I haven’t made gumbo in a few years and just blew the dust off the gumbo cookbook I bought the last time I was in New Orleans. Your recipe has me thinking I need to go to the grocery store right. now. My dad was an Italian “cajun” and made what I thought was wonderful seafood gumbo but it was with a red sauce, not a roux. Talking of gumbo makes me remember how he would work so hard to cut up the onions, spices, add the seafood and tomatoes and make this wonderful concoction that we always called gumbo. 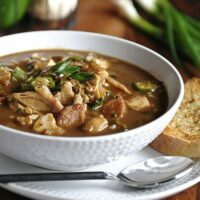 Although I think your recipe is closer to the “true” gumbo, so much of what we consider the correct way to make dishes is what we grew up with. I will have to try your version as it sounds heavenly and more healthy! that photo is of you in 1976 is too funny! I remember my mom having glasses like that too. Your photos of the gumbo look very good! I have a brother-in-law named Phil too! He doesn’t cook, however. Bummer. I think I got the short end of that stick. Thanks for this great recipe. Who knew you could make roux in the microwave? Brilliant! I love the honeymoon picture. Ellie has a coat similar to yours, and she almost looks as cute as you in it! We have been talking about roux because the word was in Tyler’s spelling bee. I am excited to show him these pictures so he actually understands what it is. Ah… so this is what the crusty bread is for! Perfect! Mom never made gumbo either and I’ve never even had okra! Sheesh….. time to find out I guess. This looks heavenly – along with your opening shot – stunning! Thanks for the recipe and the sunglass shot. Priceless! I have heard that your gumbo rates a number 11 on a scale of 1-10. You amaze me! The honeymoon picture is priceless! Had a good laugh and made my day. Actually, Elliott is more of a gumbo fan than I am, but it might be fun to try it. Wow – this looks fantastic! I just love to say the word gumbo. Gumbo. I am half French (not Cajun, though) and lived in New Orleans for 17 years. Your gumbo sounds very authentic. I love that you tried roux in the microwave! I’ll have to give that a try because stirring it on the cook top is very labor intensive. I tried a lower-fat way of making gumbo where you just brown (dry) flour at 350 degrees for about an hour or until medium brown, stirring periodically. Cool and mix it with (cold) broth when making gumbo. It turned out very tasty and didn’t have the oil “sheen” of traditional gumbo. Vicki, I’ve tried browning the flour only in an iron skillet in the oven before. It works. However, the smell in the house is something else. Did you also have that? Also takes too long for this impatient cook. But thanks for mentioning it. Other readers may want to try it for even less fat. Ha ha, well, yes, the smell is a little overpowering. It kind of smells like my mom’s kitchen at holiday time to me because browned flour was the base for a delicious duck with apple gravy we had at Christmas. I turn on the exhaust fans and make a pretty big batch at a time because you can keep the browned flour on hand in your pantry or freezer for other Cajun recipes that use roux (like crawfish etouffee’). Your comment about storing the flour reminds me. I forgot to mention I usually make double the amount of roux and freeze the extra. Very convenient. I’m not really into microwave cooking but this makes me change my mind! first time here and totally loving it! So far this weekend, I have made four of your recipes. Your photos are the shizzle! Hi there! Thank you for sharing your roux trick! I just made my own mock gumbo and the first time I burned the heck outta the roux! I will try your technique next time! Cheers! Keep up the great blog! Paige, I think burning the roux may be a prerequisite for beginners. I know I learned my lesson the first time it happened to me. Thanks for your kind words. Love this recipe, the lower fat option and the tip for making roux in the microwave. I will be trying this the next time I make gumbo. Thanks! P.S. Gorgeous photo of the gumbo! It makes me hungry just looking at it. Your recipe looks delicious – and very authentic (from a Louisiana girl who grew up on gumbo). Your brother-in-law is correct – tomatoes are not usually in gumbo. Tomatoes and/or tomato sauce make it more of a etouffee or creole sauce. I plan to try this soon. Sue, Since you grew up on gumbo, I should be making YOUR recipe. first of all, Paula I love your colourful whisk! that`s so uncanny and fun that I`d really like to have one but I`ve never seen similar. Maybe oneday 🙂 for me today`s recipe is interesting, because I`ve never eaten such meal. Looks yum! I am wicked excited to try making roux in the microwave! You are a genius! And that picture is pure gold–you are channeling your inner Jackie-O! I have made several of your recipes now and have loved them all! Thank you for what you do! My husband makes an AWESOME gumbo but it takes him about 45 min string constantly! So I am really excited about this recipe! Also wondering, I have seen your rainbow whisk in several pics now and curious do you know where you got it? Hi Hollie, The whisk is a Le Creuset brand. Think I got it at Ace Restaurant Supply but you can probably find it wherever Le Creuset is sold, including online. I have seen it at Ashers Kitchen Store for those who live in the Dallas-Ft. Worth area. I love it not only because of the colors but silicone-coated whisks have spatula-like abilities too.